Finally a textured model of the 300ton Armored Merchant. 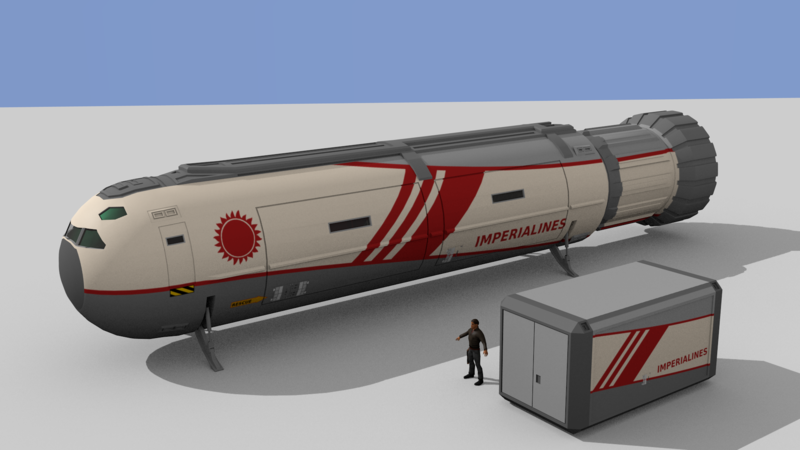 The image below shows the vessel in her Rhaan Interstellar Corp (RIC) livery. The standard Air/Raft features a matching paint job with RIC logo, while the 4ton standard Container sports an Imperiallines livery. Here it is, finally. The 30ton Ship’s Boat got a livery. And not a completely bad one I would say. The 4dt container in the image below is just a quick by-product that might see a bit of improvement in the future. 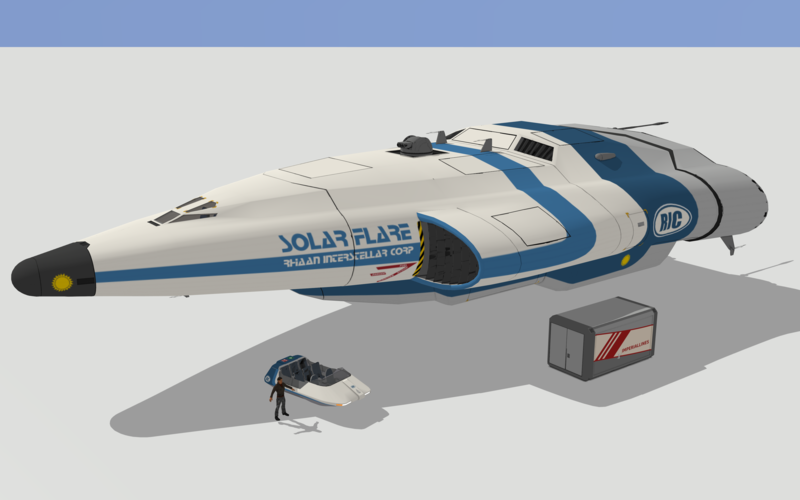 The mission of this site is to eventually model and texture all the common and some less common adventure class starships (ACS) from Classic Traveller (CT). 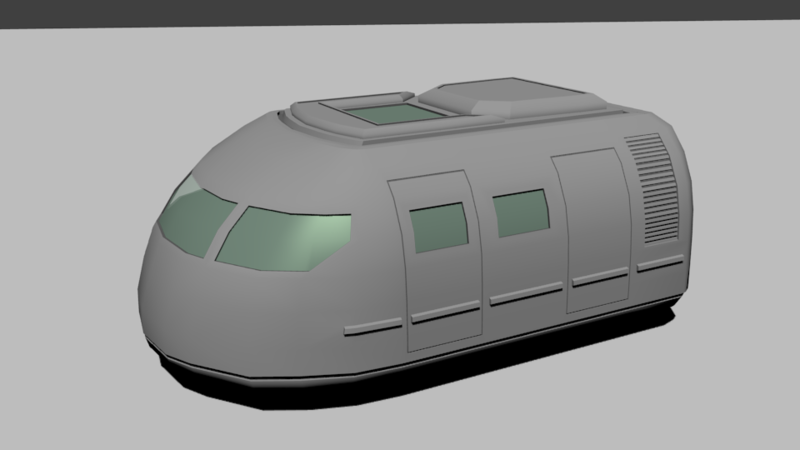 As of now I have modelled a good batch of craft that need a livery badly. 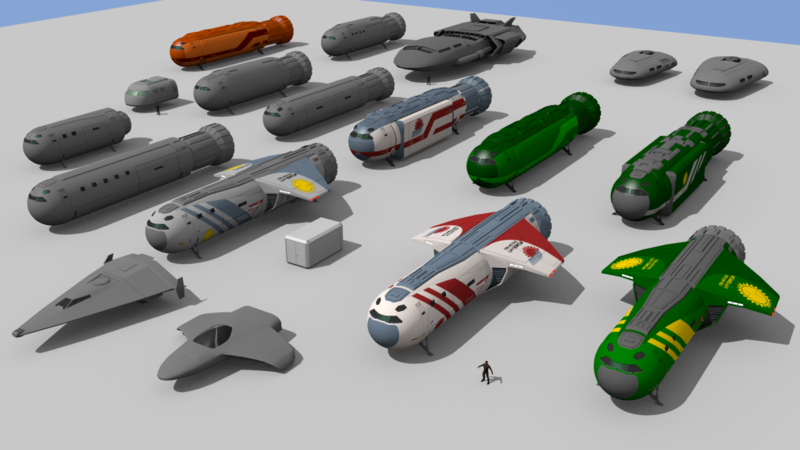 In order to see which ships or boats need one and to keep track of where I am with this venture I frequently render a group shot or parade of all (significant) models and texture variants. Of course I actually produced more texture variants for some than shown in the render below, but some were simply not to my liking. No need to bother anyone with those. 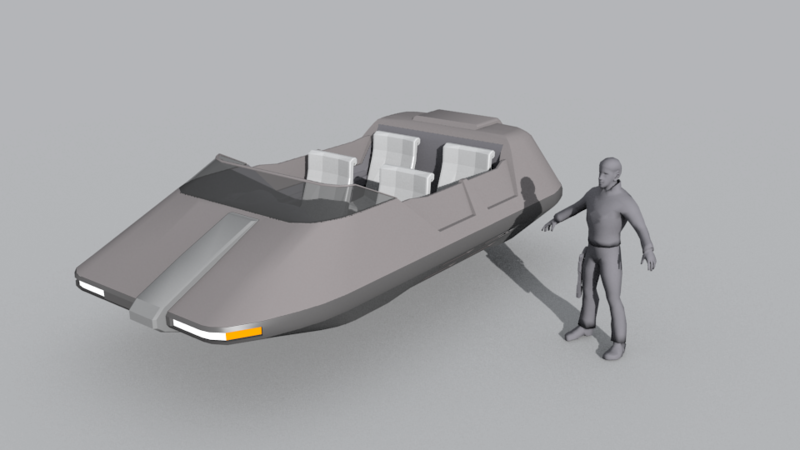 Just a quick model of a tiny craft designed by HG_B over at CotI forums. The Air/Raft is inspired by a model from Robert Pearce and follows the general shape. The TL12 Collapsible Auxilliary Fuel Tankage (CAFT) is an optional addition to a cargo bay to store liquid hydrogen as additional fuel tankage inside the cargo bay. 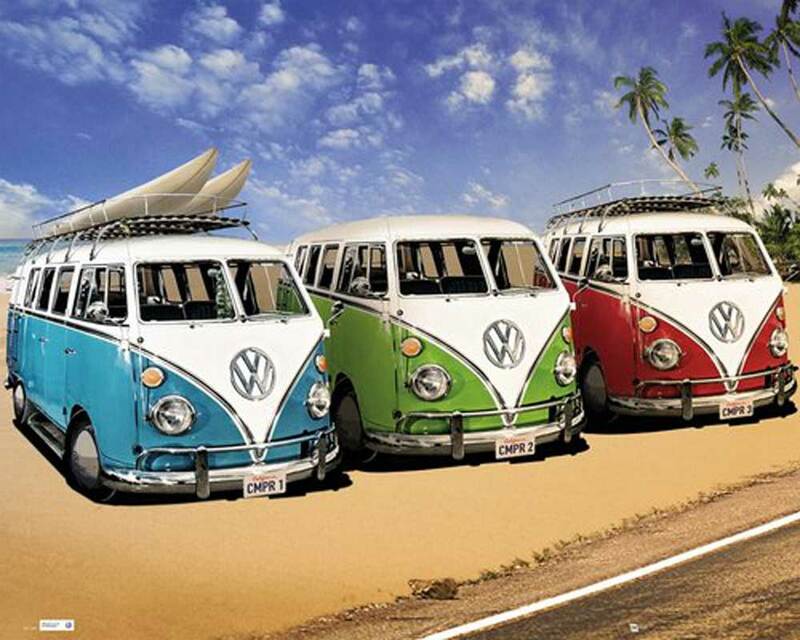 The material is flexible and conforming so no cargo capacity is wasted. Each CAFT is crafted for a specific cargo bay. Interchangeability is possible for identical cargo bays. Fuel Transfer Pumps are necessary to use the CAFT, so each cargo bay has to be fittet with the appropriate equipment (one Fuel Transfer Pump per CAFT). All CAFTs have a Cellular Design which allows incremental filling and emptying, as well as refining into the CAFTs when Fuel Processors are installed (unrefined fuel to be pumped through the processor into the CAFT (in increments of the cellular capacity (usually 2tons for ACS). Processing is possible from CAFT into another CAFT or from Main Tankage into CAFT or vice versa. Outfitters usually have CAFTs available for the most common adventure class ships (e.g. Free Trader, Far Trader, Subsidized Merchant, etc. ), though there are some ships that simply do not have enough cargo space. These Standard CAFTs have the necessary Fuel Transfer Pumps slotted into their respective deployment frames. These standard CAFTs are available at a discount. See below. Installation of piping or additional fuel transfer pumps requires at least Class C starwort facilities, an additional week of layover and lots of credits. Ships with Fuel Processors usually have the necessary piping already in place. Also available are man-portable Fuel Transfer Pumps (MFTP), but the Ship needs to have the required piping installed to use these pumps. Scout/Seeker Type J: This is a modified surplus Type-S Scout/Courier that has two 10 ton ore bays and already comes with a 10 ton Dismountable Fuel Tank, reducing ore capacity to 10 tons and increasing fuel capacity to 40 tons. As CAFTs are available from 10tons capacity up, there is no CAFT for the Scout/Seeker or any ship with less than 10tons in a single cargo bay available. The standard Type-S has only 3tons of cargo. Free Trader, Far Trader, Armored Merchant, Fat Trader, etc. 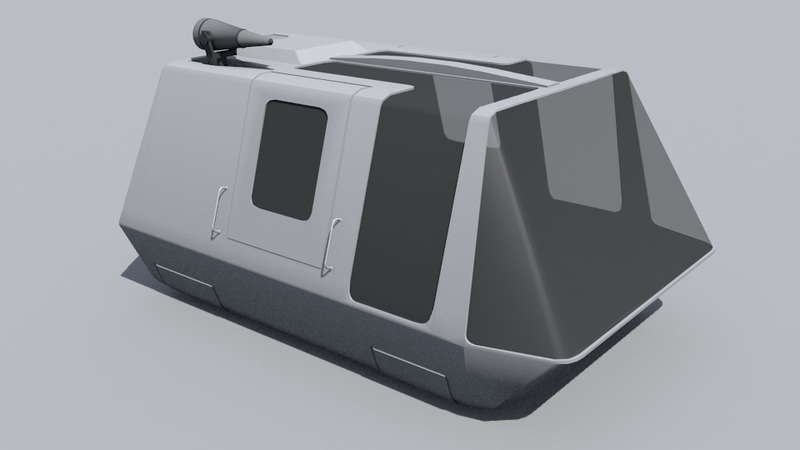 Dismountable Fuel Tanks (DFT): These auxiliary tanks are included in the original ship design (see Seeker Class). DropTanks (DT): These are external Tanks that are jettisoned prior to Jump (see Gazelle Class).